Enunciating what kind of critical knowledge is needed and why may lead to a strategic intent to externalise accessible knowledge and clarify what knowledge may be employed to sustain a competitive advantage. Where and when to externalise accessible knowledge requires both strategic consideration and the availability of knowledge management tools. The process will further inform the enunciation of critical knowledge and identify the operational dynamics needed to extract value from accessible knowledge. 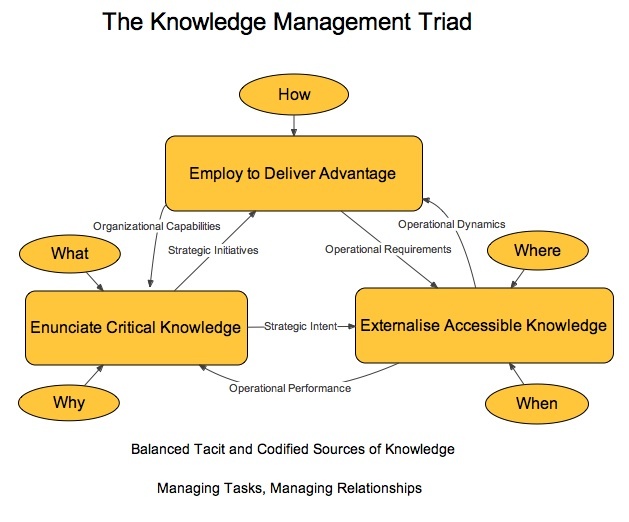 How best of employ knowledge to deliver advantage and keep the knowledge base up-to-date may also lead to changed operational requirements for externalisation and new capabilities that modify the nature of what knowledge is critical.